Datini si Obiceuri Laice de Iarna - 27/12/2007 Sighetu -M.
Happy Feast of St Nicholas! Happy 128th birthday, dear Ateneul Român! Marian's father, Cristian, was grilled by police for taking photos of the fence being put up after his son died. He was also threatened by the mayor [Alexandru Cristea]. 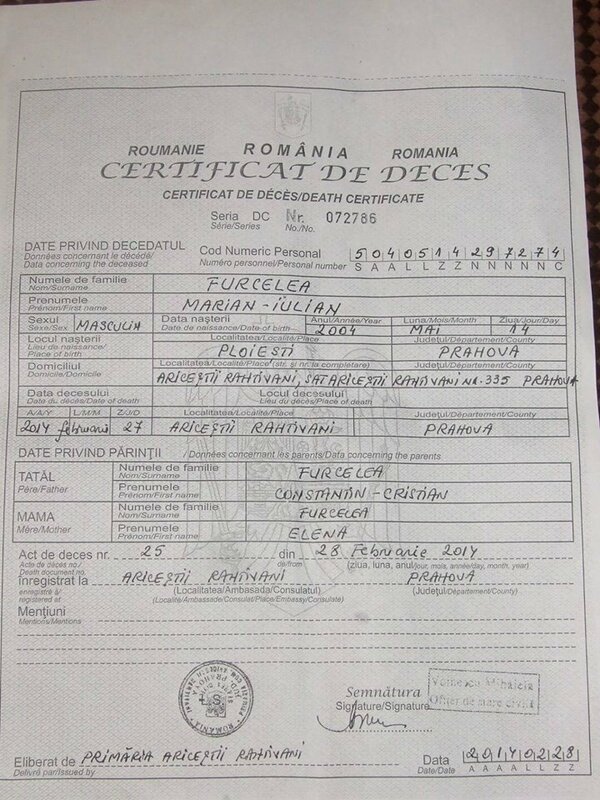 Petrom filed a complaint against Mr. Furcelea with the help of the senior management of child protection, laying responsibility for Marian's death at the feet of his parents because they had not accompanied him on his route home from school. Not long afterwards [on 21st March], an anti-riot police van drew up in front of the Furcelea family's home and took Marian's father off to the child protection centre [the article doesn't say why, but I'm presuming it was on the pretext of a hearing]. On arrival, the anti-riot police in the van laid into him (on order? ), kicking, punching him and spraying him in the face with some kind of paralysis substance. If he talked or posted [on internet?] anything, they told him, he'd be 'taken care of'. As if that wasn't enough, they hacked into his mobile phone and told him, "from now on, we'll know everything you say and to whom". This is how anti-riot police work in Romania - on the orders of high-ranking officials under the influence of petroleum companies. Even the doctors who refused to provide Mr. Furcelea with a legal document pertaining to his injuries admitted he had been beaten up. He is still in hospital and can barely speak. Such intimidation gave Cristian Furcelea cause to consider dropping the whole affair in fear for his life, but he has decided to press on for his son. Marian's father was not only brutalised because he is trying to obtain some kind of justice for Marian, but because he spoke out to the press about what is happening in his village. (Photo source - candles lit for Marian in Constanta) I saw this story on my FB newsfeed last week, but was unsure of the sources so ignored it - mea culpa. Concerned that I was being lead down the garden path and into the toolshed so to speak (it wouldn't be the first time, after all), I started googling this morning spotting more posts on my newsfeed. HERE is an article from Gândul which has been used by other news sites (couldn't journalists be bothered to come up with an original text? Seriously?! ), THIS from Romania Libera, THIS (with video) from Digi24 and THIS from Hotnews. There is also plenty on line via sites and blogs. HERE is a good, concise article from The Epoch Times (in Romanian). So where is the international press, then? Marian's death has lead to an outcry from ecological activists, support from people all over Romania and the funeral itself became a mass protest attended by activists and environmentalists from towns all over the country. 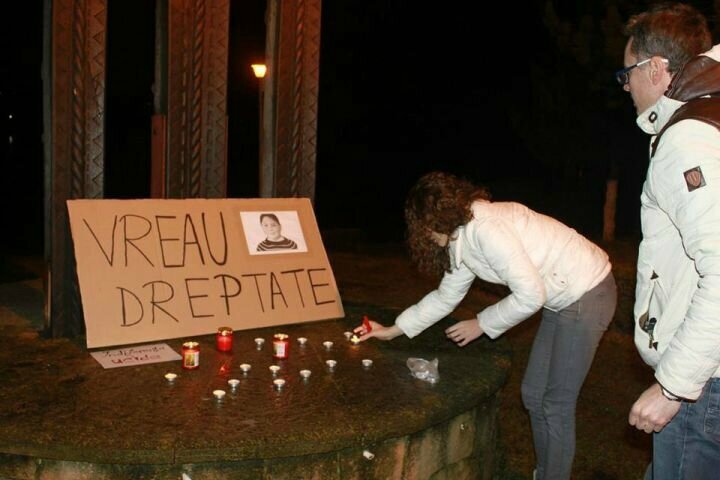 A demonstration took place at Piata Universitatii in Bucharest on 23rd March to show solidarity with the Furcelea family. Not only have they had their grief dragged through the mud, but Mr. Furcelea has been severely beaten, threatened, intimidated and humiliated. According to Gândul, Georgian Drăgan, spokesman for the Prahova County Police Inspectorate, confirmed that a criminal investigation had been launched for possible manslaughter. When contacted by AFP, OMV-Petrom representatives said: "The investigation is ongoing. We are working closely with the authorities." Yes, I'm sure. You scratch my back and I'll scratch yours. Considering that it was the 'authorities' who had the bejeezers beaten out of poor Cristian Furcelea resulting in a week of hospitalisation, I personally don't hold out much hope. Hope becomes increasingly more fragile when you read THIS update (21st March) from Nasul TV in which Leonard Dragomirescu, another spokesman for Prahova County Police, states that he checked the necessary documentation and had come to the conclusion that Mr Furcelea had NOT been taken anywhere by jandarmi of Prahova. Huh?! Furthermore, Major Mitrea (another spokesman, this time Gruparii Mobile de Jandarmi Ploiesti) says that no agent from his station in Ploiesti went to the Furcelea house either. He too had looked into the matter (they're all so hard-working, bless them) and no team had ever been sent there. So, what happened? If it really wasn't the police from Prahova or Ploiesti, then who beat up and intimidated Mr Furcelea? (Photo source) Whether or not some of you may be thinking that the Furcelea family's awful string of suffering is being used/manipulated for certain ends, there are three main issues here that can be neither denied nor ignored: 1) a dead child and a grieving family; 2) the incomprehensible lack of security, competence and decency from OMV-Petrom that ought to know better (bearing in mind this is a Romanian company with Romanian employees on Romanian land with a Romanian child who has died and a Romanian family in mourning); 3) the unscrupulous bully-boy treatment by puppets acting on orders of their unscrupulous bully-boy bosses (mayors, police chiefs, managers, etc) who are under the thumbs of unscrupulous bully-boy politicians not wanting to upset (read 'lose face and money from') these giant companies. And those three points all converge to the one destructive, lethal cancer that has metastasised throughout Romania's political class post-'89: GREED. 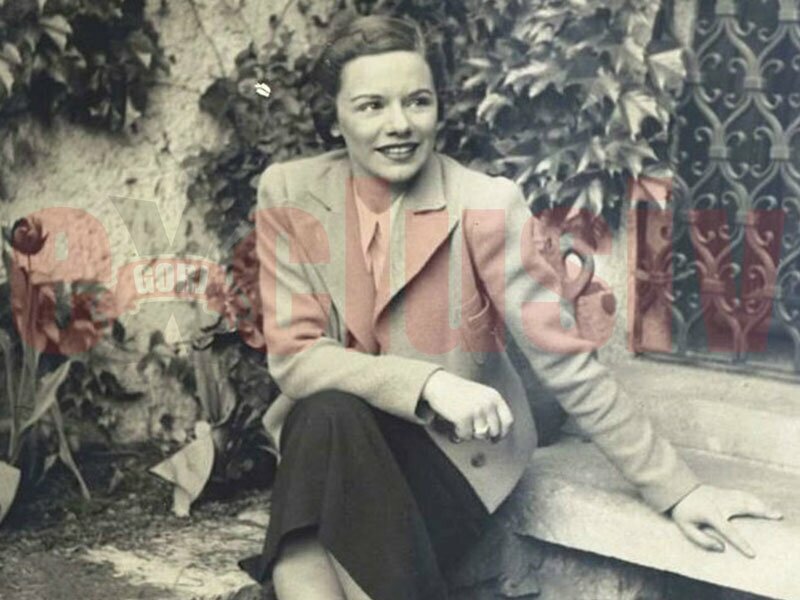 Marian's death has not only highlighted the unfathomable levels of corruption along with a shocking lack of compunction, but also the gaping void where humanity should be. 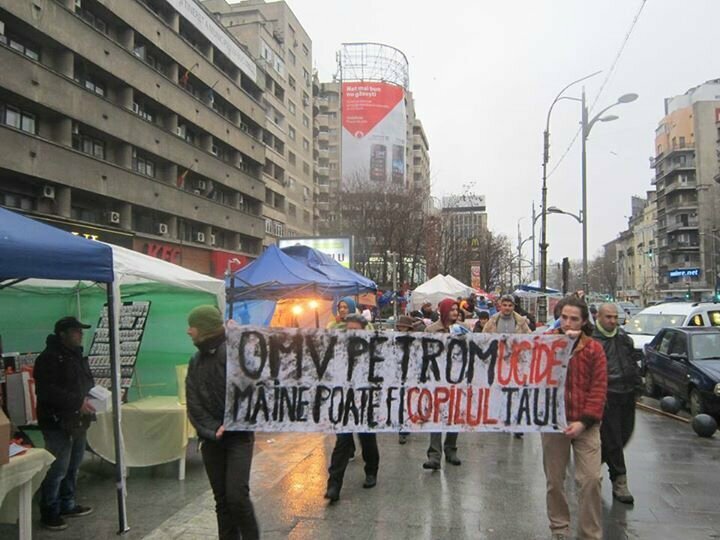 I'll end this sad yet indignant post with a message from Frack off Romania on what we can do next. Please take the time to read it, for there are many different ways something can be done on small and larger scales. This cannot be allowed to happen again. Unless there is international media attention to shame those responsible and get something done, it will. Again and again. Thank you. 2. Help us find international lawyers (specialised in human rights) to work pro bono. There are hardly any Romanian lawyers who would stand up against this giant company. 3. Write letters of complaint to the Romanian Minister of Interior in charge of the Riot Police and the OMV Petrom headquarters in Vienna. 4. Financial aid is needed for this family to bear the cost of legal fees. We have already sent 110 euros collected from donations. Further donations will be withdrawn from paypal on Monday. All info as to how donations are being managed and used is posted HERE. THANK YOU IN ADVANCE FOR YOUR SOLIDARITY AND SUPPORT! 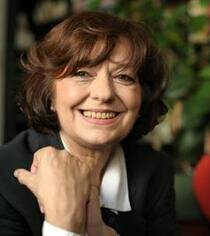 1st April UPDATE: Info from Hetti Benedek's FB wall: Hetti spoke to Cristian Furcelea yesterday. First off, he has managed to get the necessary discharge papers from the hospital, which (I guess) prove he was there and why, and, more importantly, the treatment he received. They are currently with his nephew, but once Cristian has them, they can be added to his file against the county police. Also yesterday, Hetti sent the family 750 RON (approx. 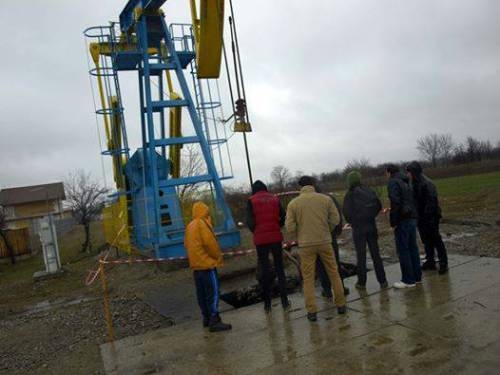 170 euros) towards legal fees in their case against OMV-Petrom. The search for a pro bono lawyer continues, so if anyone has any connections for that, please contact Hetti either via FB or at hetti.benedek@yandex.com. 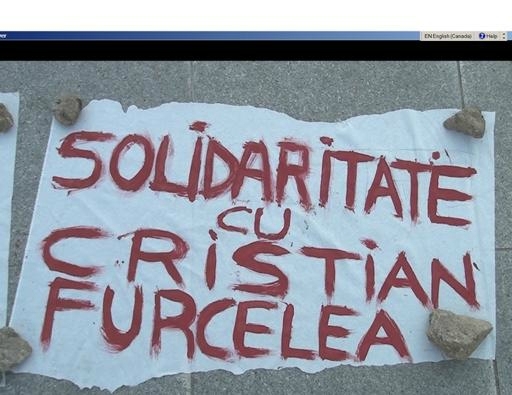 Further news is that a formal complaint filed by activists from Ploiesti to the county police on behalf of Cristian Furcelea has been answered. Signed by George Dinica at Prahova County Police Inspectorate, the response repeats that they were not responsible for Cristian's arrest, subsequent beating, etc., but does not 'exclude' the possibility that the police team could have been sent from another area or county. There will be a full police investigation. Let's hope they will do what needs to be done without bias, and those found to have carried out such a brutal act dealt with appropriately. 2nd April UPDATE: Activist Hetti Benedek received the hospital discharge papers for Cristian Furcelea today, where you can read in black and white that he had been beaten up. Great, right? Wrong. This is Absurdistan, after all. It seems that the hospital discharge document is invalid. Why? Because it has been replaced by a NEW discharge document. This is the OLD one that hasn't been in administrative circulation for 4 years. Cristian must be in possession of a document called HIPOCRATE which is used on a national scale these days. Absolutely insane. WHY would a hospital give a document to a patient proving his admission, discharge, diagnosis and treatment that is no longer valid throughout the entire country, so useless, unless that was the plan. A nice sowing of obstacles... Does Mr Furcelea now have to take on the health service as well as the police and OVM-Petrom? Come on. Give the guy a break. In this latest update, Hetti also adds that she has sent donations that cover half the lawyer's fees in the case against the county police so far. The family DESPERATELY need a pro bono lawyer, so if anyone has any connections, please contact Hetti. More news as it happens (and bravo Hetti!). 2nd April, 23h: Hetti (not only activist now, but super-sleuth extraordinaire) found out earlier today that if the 'old' papers from the hospital are signed by a doctor, they are accepted in a court of law. Amazingly enough, they ARE signed by a doctor, so thank goodness for that! Thank you Sarah in Romania. Anti-riot Police = Iron Guard. Are they run by Vladimir Putin? Their actions are his style. No. They're run by Ponta. Same difference though. John Inverdale and Sam Smith are commentators on sur Why is Simona Halep STILL being ignored? "Who" are John Inverdale and Sam Smith? Isnt more sur Why is Simona Halep STILL being ignored?